DC Comics. PAPERBACK. 1401248195 Brand New ,Original Book , Direct from Source , Express 5-8 Business days worldwide Delivery. . New. DC Comics. Paperback. 1401248195 Please allow 4 - 14 business days for Standard shipping, within the US. Thank you for supporting our small, family-owned business! . Fair. 2014-05-13. International editio. DC Comics. Paperback. 1401248195 Please allow 4 - 14 business days for Standard shipping, within the US. Thank you for supporting our small, family-owned business! . Fine. 2014-05-13. International editio. DC Comics. PAPERBACK. 1401248195 Like New Condition. . Fine. Penguin Random House, 2014. Paperback. New. DC Comics. Paperback. 1401248195 Please allow 4 - 14 business days for Standard shipping, within the US. Thank you for supporting our small, family-owned business! . New. 2014-05-13. International editio. 2014-07-03. Good. Ships with Tracking Number! INTERNATIONAL WORLDWIDE Shipping available. May not contain Access Codes or Supplements. May be ex-library. Shipping & Handling by region. Buy with confidence, excellent customer service! 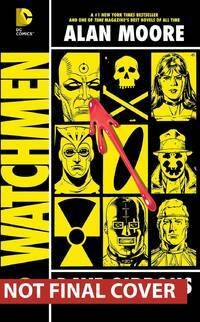 Dave Gibbons - Watchmen International Edition - Paperback. Book. BRAND NEW. DC Comics, 2014. First edition of this new edition. Paperback. Near fine. Near fine condition. DC Comics, 2014. First edition of this new edition. Large format paperback (two small nicks on the edges of the cover) in fine condition. Illustrated. Nice and clean pages as new but with previous owner's written inscription inside the edges of the back endpage. Heavy book Usually dispatched within 24 hours, First class. DC Comics. PAPERBACK. 1401248195 New Condition. . New.